The Tennessee Museum of Aviation in Sevierville hosts a climate-controlled, 35,000 sq ft hangar filled with arrays of exhibits and memorabilia. It also has real warplanes that fly, and a runway right outside the hangar doors to prove that museums don’t have to be dull, or quiet, or even stay still without moving! 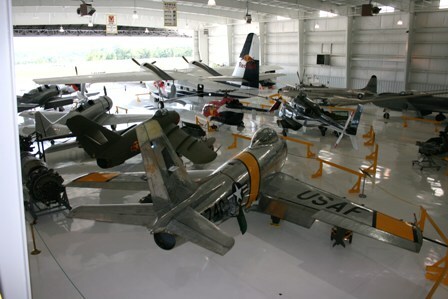 The TN Museum of Aviation is dedicated to Airworthy Warbirds – vintage military aircraft that fly. Exhibits change frequently as planes fly in, stay a while, and fly somewhere else. You never know what you’ll find during a trip to the museum, not to mention what’s taking off and landing – the hangar is located beside the runway of the Gatlinburg-Pigeon Forge Airport (KGKT). Visitors can enjoy flight demonstrations, as well as guided tours of the indoor exhibits. If you’re an aviation enthusiast you’ll know that there are less than a dozen World War II, P-47 Thunderbolt aircraft remaining in the world, but you may not know that the TN Museum of Aviation houses two of them, both airworthy and ready to prove it! You don’t have to be an enthusiast to love a warbird that can still fly and strut its stuff. Colorful and powerful, built for action and ready to rumble, warbirds on the ground and in the air are guaranteed to excite ALL children, and provide family fun for hours. The hangar is a great place for any club to hold a meeting, year round in any weather. Large or small, business meetings, class or military reunions, company picnics, the museum welcomes the opportunity to host gatherings, and as a non-profit organization offers very affordable prices. People love to gather and socialize among the magnificently restored warbirds in the huge hangar. Group tours and youth tours are a specialty of the museum, catering to school and home-school groups, scout troops, students of all ages. How about a children’s Birthday Party in the hangar? This is a unique treat for kids, including a scavenger hunt, surrounded by planes, military vehicles, engines, and even a Skyhawk cockpit to sit in. It’s the perfect setting for photographs and unforgettable memories. The TN Museum of Aviation is open 7 days a week year round, 10 am – 6 pm Mon-Sat, and 1-6 pm on Sundays. The museum’s website offers contact information and directions (it’s just up the road from Pigeon Forge and Gatlinburg). Also check the museum’s Facebook page for latest happenings and lots of pictures and video footage. And the YouTube page has some of the museum’s own video clips. So now you know about the Tennessee Museum of Aviation. This all-weather, best-kept secret is calling your name for the next time you want a gathering or an outing of family fun!